This is a menu for the Association of Former Manchester United players (AFMUP) charity sportsmans dinner held on 2nd October 2003. The dinner was held at Old Trafford and was attended by many former Manchester United players. The guest of Honour was Alex Stepney the former United Goalkeeper who has personally hand signed this menu for me. Alex Stepney kept goal for Manchester United when they won the European Cup in 1968. 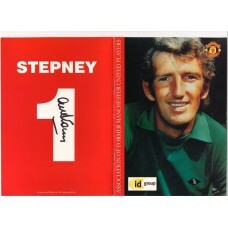 Alex Stepney played for United 535 times between 1966 and 1978, during which time he scored 2 penalties. Stepney was also capped once by England.